Thanks Andreas for sharing. Most Americans cannot imagine the US government complicit in killing its own people. But the govt does every day when cops murder innocent unarmed non-whites with impunity. Both videos shine a light on some hard truths about the US. Very true! But to credit the US Population: the percentage of sceptics towards the “official narrative” on Nine Eleven in the US outnumbers the percentage of sceptics in Germany by far! Only very few are brave enough in Germany to say: False Flag attack! A celebrity pep talk. Very nice. And so uplifting too. Soothing? Surely! Radical? No! Will it change anything? Absolutely not. 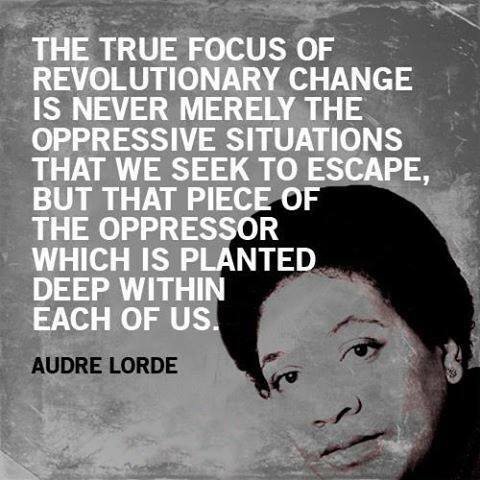 Remember Audre Lorde’s “the master’s tools will never dismantle the master’s house.”? I’d call THAT the raw reality, and THAT’S what the audience should take to heart, and……. (finally) act on same! Anonymous? Lmfao! WP in its brightest. It was me , sugar. It does happen to white people. A more accurate statement would be: “it rarely happens to rich people”, the evidence, though overwhelming, is worthless if ignored. http://thefreethoughtproject.com/category/cop-watch/police-brutality-cop-watch/ Explore all 158 pages, or roughly 1500 cases, and keep telling yourself it doesn’t happen to white people. The level of brutality is outrageous, but they don’t want us to know we are all in the same boat or we might cooperate and keep the boat from sinking. Thanks Onno, police brutality does happen to poor whites. Many of those cases go to trial and there are convictions plus monetary settlements. In the vast majority of cases involving Blacks, cops walk free without any charges. We talk about PTSD from the Orlando shooting, what about these families and communities that have lost their children or parents or friends to a preventable brutal violent act by a public servant who was hired to serve and protect? In many ways, police brutality is a worse betrayal of public trust than child molester priests. Cops walked free in the Nick Christie case, they were sued, but the settlement came out of MY pocket! I know who they are, got the court docs. The cop in the Punta Gorda dog mauling is still on the job, so is the dog! The victim is permanently disabled and can no longer work. How about child molester cops, got ’em! Cops doing Prostitutes on duty in their squad car, got ’em! Etc., etc.They always say: If you got nothing to hide, why are you running? Watch the videos! That’s why! Thanks for the links. I have to get a bottle of wine before I start watching them. Here is some more information. Police integrity lost: a study of law enforcement officers arrested. https://www.ncjrs.gov/pdffiles1/nij/grants/249850.pdf 1100 officers in one year. Welcome! Working it through the system does not work, but we’re networking and publishing information in a way that is difficult to take down. Push back has started, let’s hope this works, ..for everybody! I’m sick of it! Agree, though our networking we can establish a database that will be difficult to take down. From that database we can show the current justice system does not work. Let’s see where it takes us. I too am very sick of it! From that report: “…….no government entity collects data on all criminal arrests of law enforcement officers in the United States.” That says it all. No data means it did not happen. Perhaps one reason it happens daily. Bon dia Roald, “that says it all” indeed. Have a good one!